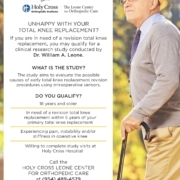 In my previous blog post, I shared that one out of five people (approximately 20 percent) who undergo Total Knee Replacement (TKR) are not satisfied with the result. I discussed the methods we use to understand the exact cause/causes of unsatisfactory outcomes, in order to improve these results. In the first of three additional blogs, I’ll share strategies designed to solve specific problems that have occurred after TKR. A current trend in medicine is to place more emphasis on our patients’ perceptions (Patient Reported Outcome Measurements or PROM) regarding how they think they are doing after surgery. How a patient perceives and reports his or her result is highly correlated with pre-surgical expectations. 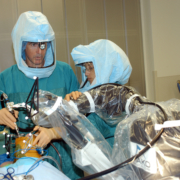 For example, a person who preoperatively has minimal knee symptoms and/or limitations and undergoes TKR is much less likely to be satisfied after surgery compared with a patient who is remarkably limited and in great pain before surgery. This reinforces the importance of discussing with your surgeon what your post-TKR goals are and if these goals are reasonable. 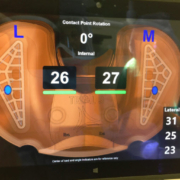 An important principle when revising a failed total knee is that all the problems that resulted in a less-than-satisfactory result must be solved. Loosening and/or wearing of component(s) after a total knee that has functioned for many years and millions of cycles is not uncommon. 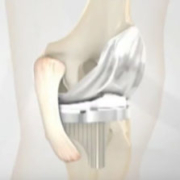 As the tibial and patella plastic wears, it can result in a stable knee becoming unstable. Plastic debris particles are released that incite an inflammatory response often associated with an effusion (increase synovial fluid) and synovitis (lining of the joint becomes inflamed). This inflammatory environment can activate osteoclasts, which are naturally occurring cells in our bones whose job it is to destroy bone. Normally, osteocytes balance the destruction by producing bone with dynamic turnover and remodeling. But in this situation, bone destruction becomes excessive and leads to osteolysis or bone destruction. 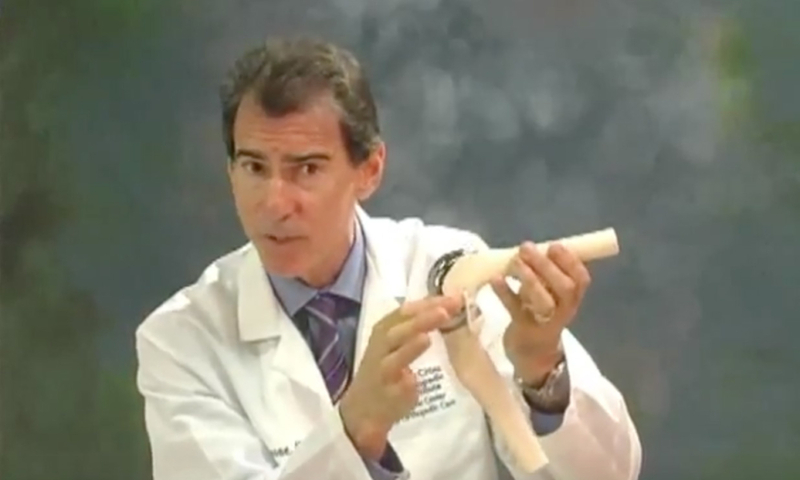 As the bone that supports the prosthetic is destroyed, the prosthetic can loosen. A fracture also can result in a component loosening. This often is sudden, dramatic, associated with trauma and usually easily seen on X-rays. Occasionally, components can loosen in the early postoperative period if a press fit component is used and bone fails to grow into the porous surface or the cement bone interface fails when using a cemented TKR. Both cases can lead to pain and instability. Sometimes, a diagnosis of component loosening or wear can be made if subsidence or unintentional movement of the prosthesis is seen on radiographs. This is most easily recognized when comparing serial X-rays over time. X-rays also can show subtle separation at the prosthetic bone interface. The X-ray beam must be parallel to the prosthetic surface that is cemented or press-fit to bone, so occasionally special X-rays or projections are necessary. Many times X-rays don’t show loosening or wear even if present. If component loosening is the culprit, then it is necessary to revise the component to one that is stable. If one component is excessively worn, then it must be replaced. In my experience, loosening and wear seldom are isolated problems. Remember, all of the problems must be solved to deliver the best postoperative result possible. I also mentioned in my initial blog post how some patients develop pain, synovitis and effusions after TKR that are secondary to metal allergy. While this can happen, it is rare and difficult to prove. This is a diagnosis of exclusion. All other possible causes including infection must be ruled out first. At this time, we don’t have a specific test that can confirm that the symptoms truly are from hypersensitivity. While there are no proven nonsurgical treatments available, treatment with NSAIDs and physical therapy might help. I think intra-articular injections should be considered, but with caution. I stated earlier that we have no evidence that patients with known metal allergies have a higher rate of failure or revision of primary TKR than those without. If a decision is made to proceed with revision for presumed metal allergy, it should be done after careful discussion between patient and surgeon, weighing hopeful benefits with risks. During this revision, cobalt chromium components are removed and replaced with a femoral component made of ceramic or a titanium alloy. If the tibial component also is made of cobalt chrome, it too needs to be revised to one fabricated with a titanium alloy. In the second of three posts I will discuss the importance of diagnosing and treating infection which can account for a painful TKR. It’s interesting that the discomfort started two years ago only in right knee and was not present during the first three years of post-surgery. I assume that you were happy with the result of the right knee for these first three years. I also assume that the left knee is continuing to do well. It does suggest that something changed. If the components are not loose (this is not always an easy diagnosis to make with plain X-rays or a bone scan), infected (hopefully ruled out with aspiration), or referred from another source such as the hip or back, then it suggests a soft- tissue problem. Considerations are hypertrophic scar tissue which is creating impingement or irritation or attenuation (stretching out) of the structures making up your lateral soft tissue sleeve, resulting in these structures no longer adequately supporting the knee as it moves and functions and resulting in pain. Possibly, clues would be present from a physical exam with the advantage that an exam of the right knee can be compared to the left. If it’s thought to be secondary to soft-tissue impingement or irritation, possibly an arthroscopy may help. If laxity compared to the well-functioning left side is appreciated, then an open surgery and rebalancing or revision may be indicated. A selective intra- articular versus extra-articular injection is also a consideration. I would suggest you continue to share your symptoms and concerns with your surgeon and ask for his or her opinion and guidance.